This October, I'll be visiting London for the sixth time. As always, I'm going to see a musical or two, and I like buying my tickets in advance. I know some swear by whichever last-minute discounts may be available – but I find buying tickets in advance saves lots of time and hassle, so it's often worth the extra price. I enjoy planning my schedules beforehand. I don't even rush to Finnish shows on last-minute discounts, so I think doing that during a vacation would just add to the inevitable holiday stress. When it comes to London, however, buying theatre tickets adds to your stress levels, no matter how they're being bought. How, situated in one of the most visited cities in the world, can the West End theatres have such a medieval ticket booking system? In Finland, you go to a theatre's website, pick the show and the date, pick your seat, pay with your credit or debit card, print your ticket, and you're done. If you decide you'd rather pick up the ticket from the theatre, just purchase it via the box office and pick it up whichever day you please! When buying tickets to West End musicals... Where do I begin? Well, first, you find a show you'd like to see and a date that suits you. You might run across a site that sells you musical tickets in Finnish. You soon leave the site, though, when you notice they seem to add ludicrous amounts of fees on top of the ticket prices, sometimes 30 or 40 € worth of extra on a single ticket. You might then think Ticketmaster is the site to go. But don't be fooled by the fact that when you buy tickets from the Finnish version, you can print them right away with your own printer, for a small extra charge. Instead, prepare for large fees, a ticking clock that gives you a minute and a half to fill out eighteen different information fields, and the tickets being sent to you by traditional mail two days before the show, quaranteed. If it happens you'd like the tickets to your home adress a week before the show already, again quaranteed, shell out some ten pounds more and move to the checkout. Printing the ticket, you ask? Unheard of! Scrap Ticketmaster, we're going to book the tickets directly from the theatre. At first glance, buying from the theatre is easier and cheaper. You book the ticket and pay with a credit card. But when you arrive at London, remember to have the credit card you used with with you. It wasn't your credit card? Someone bought the ticket for you? Quite impossible! It seems each West End theatre has a small print somewhere on their website that says the person who bought the tickets, and the card they were bought with, must be present at the box office when picking the tickets up. If it happens that someone in their teens or early twenties would want to see a musical... Someone who's old enough to travel alone but too young to get their own credit card yet, so they'd have to ask a family member to pay their tickets... Don't even think about it! I've been in this situation countless times. My parents usually travel with me, but they aren't into musicals – so I don't think it's the high point of their holiday to be dragged to five different box offices to pick up my tickets. I've cheated the rules sometimes and picked the tickets up alone, since some box offices are sensible enough not to check every credit card. But some do, so going alone is terrifying. What shall I say if they ask for the card? 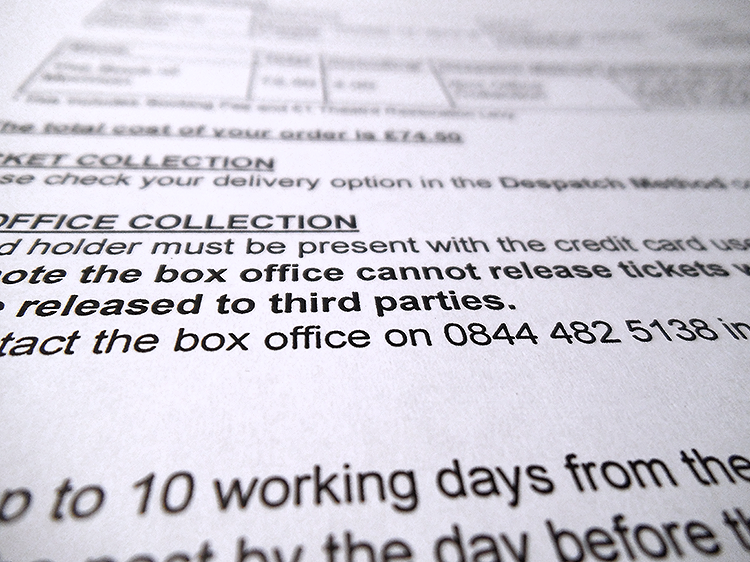 Some theatres' rules generously state that if the card owner signs a permission for another person to pick up their ticket, it will be fine – but some don't, so it's always an unpleasant adventure. There's an extra twist of excitement in all of this: in most cases, the tickets you booked aren't available until one hour before the night's performance. If it happens you're that late-teens-to-early-twenties person who cannot yet get their own credit card, with parents who'd much prefer a pint at a pub or a walk by the river to visiting box offices night after night... Too bad for them, they'll have to come to the theatre with you every night anyway. This all makes me see red. How can a simple thing be made so infuriatingly difficult? What is the purpose of a system like this? Bullying tourists who enjoy a night out at the theatre? 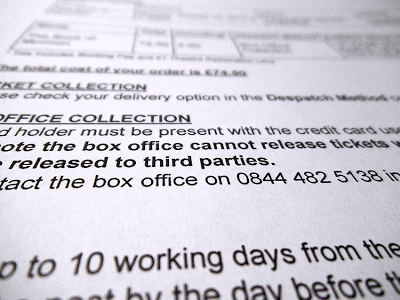 Why isn't a printed receipt from the online store enough to convince certain box offices that the tickets can be given to someone, why do they demand seeing the credit card? Why can't the tickets that have already been paid for be picked up earlier than an hour before the performance? Why on earth printing your own ticket isn't possible even for the most popular West End musicals? I'd love to see the West End box offices wake up and notice they're in the 21st century. Stressing foreign visitors out like this has to stop. People actually own printers nowadays. And even in here, the far-away, cold, tiny country of Finland, you can pick up the tickets you've bought on whichever day you choose, not just an hour before the performance. So why can't London's famous West End figure that out? What purpose does it serve to make ticket purchases this difficult for tourists – especially seeing how the income from tourists helps to keep the West End musicals alive? I'm hoping that when I one day plan my seventh London adventure, I can finally print all my tickets at home and just enjoy the shows. For your information: this text is mostly about the musical character. I don't know the book inside out enough to really discuss the book character in depth. As long as I've been a Les Mis fan (what, four years now?) I've been slightly obsessed with the character of Enjolras. A task: identify all the Enjolrati pictured. A hint: the first one's never played the role. Enjolras in the musical, at the first glance, is hardly a character – he's a symbol. If you want to perform a Les Mis medley in a concert, you just need to have a guy walk onstage with a big red flag and everybody knows what they're going to hear, even before a single note is played. In the West End version of the musical especially, it's almost as if the character exists to be a memorable visual. The image of Enjolras with the flag is so striking that Queen's Theatre in London even has a three-story-high billboard with it on the outside, right next to the Cosette logo. Still, the character could just as well be called Joe; his name is never mentioned in the show's libretto. (I've heard people call him, among others, "the one in the red coat", "the soldier boy", "the ponytail guy" and "what, there was a character like that?") 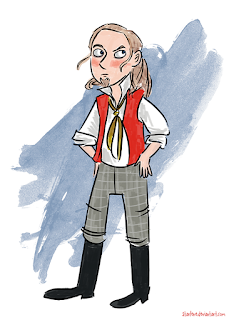 He has some big notes and the fanciest vest in the whole cast, but no proper solo and little stage time. Enjolras is of course the leader of Les Amis de l'ABC, a group of rebellious students. They all have distinct personalities in the book, so many people enjoy observing whether the actors bring that across in their performance. I, however, don't much like Les Amis. It took me two years to learn the difference in between Combeferre and Courfeyrac (and to this day, I keep confusing the two). I can see why people love the characters, but I don't love them myself. I'm of course not alone in this. Enjolras, judging by the amount of fan discussion centered around him, just might be the most popular character out of the whole show. There's of course a lot of positive fan activity around the character too, not just bickering. 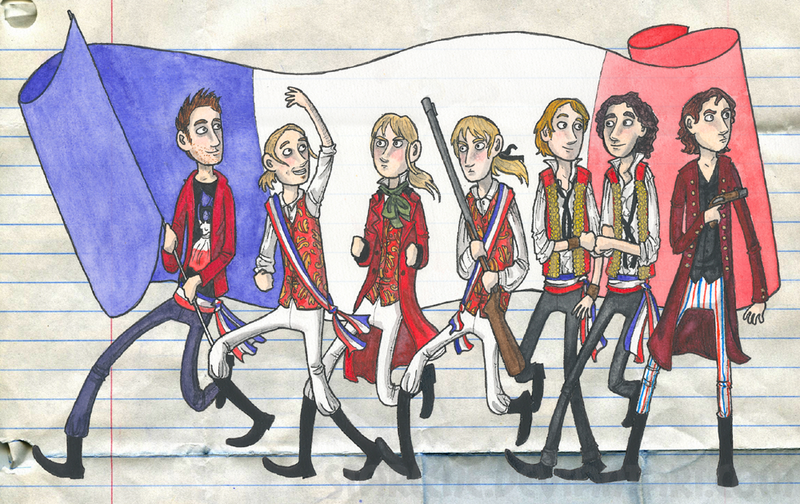 Enjolras is one of the most popular subjects in Les Mis fanart. He's a lot of fun to draw. No matter which production, his costume always pops, with its reds and tricolours. And who wouldn't enjoy drawing the glorious hair mentioned in the novel! Still, when it comes to fanworks centered around Enjolras, I think the my favourite part is how easy he's to make fun of. I know that if you look at the book closely, there's a wonderful three-dimensional character in there – and many fanartists show just that. But oh, the humorous possibilities in turning him into an barricade-building obsessed maniac! 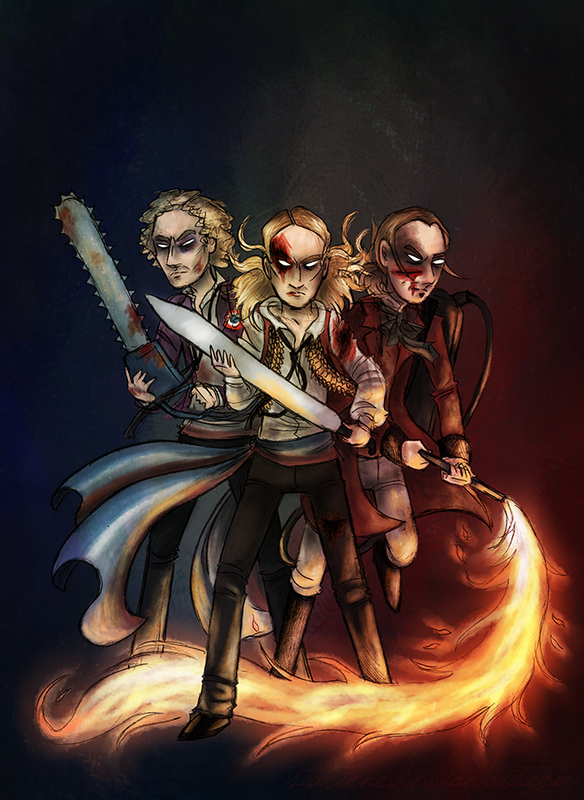 As for the musical, I'm still looking for the ultimate stage Enjolras. I've seen some good and even downright amazing ones, but I've yet to see the one I think is 100% perfect, one that doesn't play the character but is the character, like I feel about Earl Carpenter as Javert. These are huge expectations, though, and I wonder if the perfect Enjolras can exist at all. Maybe he'll only ever live in between my own two ears. The likelihood that any actor or director would think exactly like I do on everything Enjolras-related is pretty slight. Still, I'll keep wishing to see that happen one day. On the meanwhile, I'll keep enjoying the different portrayals. Maybe I'll even take part in a fandom discussion or two. Just for good measure. The illustrations in this blog entry are by me. 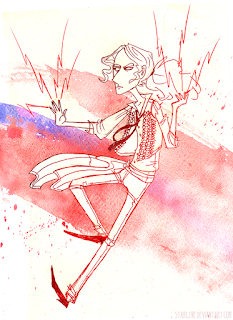 See more Enjolras art in my Les Misérables fanart gallery!